Tsung-Dao Lee was born in Shanghai, China, on November 24, 1926. He was the third child of businessman Tsing-Kong Lee and his wife Ming-Chang Chang. Lee attended the Kiangsi Middle School in Kanchow, China. After graduation he entered the National Chekian University in Kweichow, China. When Japanese troops invaded the area in 1945, Lee fled to the south, where he continued his studies at the National Southwest Associated University in Kunming, China. In 1946 Lee was presented with an unusual opportunity. When one of his teachers at Kunming, a physicist named Ta-You Wu, decided to return to the United States (where he had worked toward his doctorate degree), he invited Lee to accompany him. Lee accepted the offer but found himself in a somewhat peculiar position. He had only completed two years of college and found that only one American university, the University of Chicago, would accept him for graduate study without a degree. He decided to enroll there. Lee married Hui-Chung Chin (also known as Jeanette) in 1950, while they were both students at Chicago. The couple eventually had two sons. In Chicago, after working under physicist Enrico Fermi (1901–1954), Lee was awarded his doctorate in 1950 for his study of the amount of hydrogen in white dwarf stars (stars of low brightness with a mass similar to that of the sun). Lee also renewed his friendship with physicist Chen Ning Yang, whom he had known in Kunming. The two began working together. In 1950 Lee went to the Yerkes Astronomical Observatory at Lake Geneva, Wisconsin, and Yang went to the Institute for Advanced Studies at Princeton University in Princeton, New Jersey. 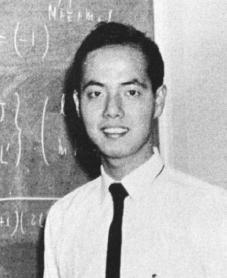 Lee then spent the next year as a research assistant at the University of California at Berkeley before accepting an appointment at Princeton in 1951, again reuniting with Yang. Even after Lee left Princeton in 1953 for a post as assistant professor of physics at Columbia University, he continued to work with Yang. The two worked out a schedule that allowed them to continue meeting once a week, either in New York City or in Princeton. These meetings had begun to focus on a subatomic (smaller than an atom) particle known as the K-meson. Discovered only a few years earlier, the K-meson puzzled physicists, because it appeared to be a single particle that decayed in two different ways. The decay patterns were so different that physicists had become convinced that two different forms of the K-meson existed, forms they called the tau-meson and theta-meson. The single difference between these two particles was that one form was conserving parity and the other form was not. Following a concept long held by physicists, if the properties of a particle and its mirror image are the same, it is said to be "conserving parity." The problem that Lee and Yang attacked was that all other evidence suggested that the theta-and tau-mesons were one and the same particle. During a three-week period of work in 1956, Lee and Yang solved the puzzle by suggesting that, in some types of reactions, parity is not conserved. The decay of the (one and only) K-meson was such a reaction. They then created a series of experiments by which their theory could be tested. The basic elements in the Lee-Yang theory were announced in a paper sent to the Physical Review in June 1956. Six months later another physicist, Chien-Shiung Wu, carried out their suggested experiments, first at Columbia and then at the National Bureau of Standards. The Lee-Yang prediction was found to be correct in every respect. Less than a year later, the two friends were awarded the 1957 Nobel Prize in physics for their work. After a promotion to professor (1956) at Columbia, Lee returned to the Institute for Advanced Studies in 1960. He then was appointed Enrico Fermi Professor of Physics at Columbia in 1963. In 1984 he was made University Professor at Columbia. In 1980 Lee created a program to give talented Chinese physics students the opportunity to earn graduate degrees in American schools, as he had. In 1989 he helped create the China Center of Advanced Science and Technology World Laboratory, and he continues to travel to China every year to encourage scientists there. In 1994 Lee became a member of the Chinese Academy of Sciences. In 2000 the World Journal (a Chinese newspaper in North America) included Lee in its list of the "Most Notable 100 North American Chinese of the Century." The Nobel Prize winner continues to work as a professor at Columbia and is involved in a variety of physics research projects. Bernstein, Jeremy. "A Question of Parity." New Yorker (May 12, 1962): p. 49. Crease, Robert P., and Charles C. Mann. The Second Creation. New York: Macmillan, 1986, pp. 205–7. McGraw-Hill Modern Scientists and Engineers. vol. 2. New York: McGraw-Hill, 1980, pp. 215–16.